Want a straight AR-15 rifle without the gun store jargon? Well my friends, if you're interested in a magazine-fed, gas-operated, semi-automatic rifle, I have a list for you. Here's a lineup showing 10 of the best AR-15 rifles that come at the nicest price for what you get. They vary in specialization, with some great for home defense and others catered towards long range shooting. Not all of them are under the $1,000 mark, and I'm quoting factory MSRP for a complete rifle, not a bunch of custom-fitted gun parts. Scroll through the photos to see the 10 best-priced AR-15 rifles. They aren't exactly new products, but they'll get the job done. I could not find official MSRP on their website, but a Gunbroker listing had the rifle at $975. I would expect about a $1,000 - $1,100 for a new one. It comes equipped with six-position adjustable buttstock, A2 handguard, 16-inch barrel, high-rise gas block and the kind of detachable 10- or 30-round AR-15 magazines that make these guns so great. Smith & Wesson comes to the table with a budget rifle aimed at the average range-goer. They know that most people don't care about dust covers, lug nuts, M203 barrel cuts, and less than a 1/9 twist. They give you what you want in a rifle. Factory MSRP is $739. No list of best-priced AR-15s would be without the original Armalite. Factory MSRP is $1,073 and for what you get, this rifle is practically a steal. The slightly longer barrel and other features make this a very popular rifle. Smith & Wesson is a legendary American company for good reason. Their M&P line comes to market with exceptional quality at a high value. Get their AR-15 decked out with Magpul Dynamics gear at the factory MSRP $1,259, and you won't have to invest in other AR-15 parts. The magazine release is smooth, and it includes what some consider the perfect AR-15 barrel. One of the longest running contractors to the U.S. military, Colt puts out some amazing rifles. The LE6920 is a competitively priced tactical rifle that is still in active service with many law enforcement units. The barrel length is ideal, and the iron sights work wonders. Factory MSRP is $1,155. Daniel Defense is a premium manufacturer of whole rifles and their components at reasonable prices. They employ revolutionary techniques, almost sci-fi type metals and they sell to elite forces everywhere. The DDM4 Light Weight comes to you at factory MSRP $1,799. 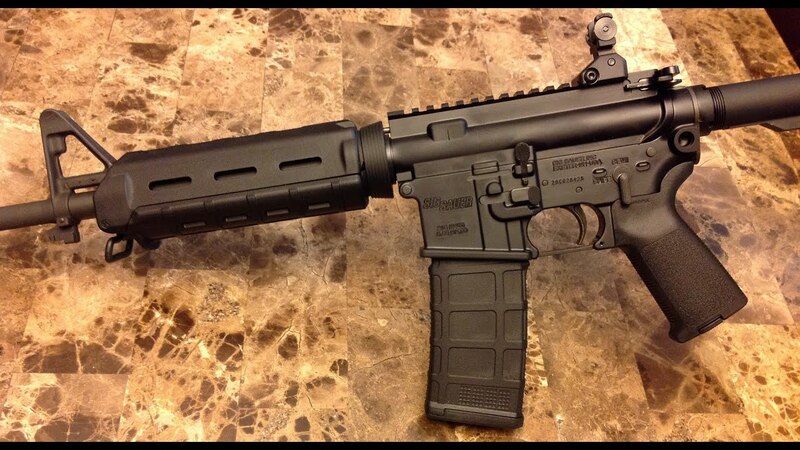 The gun comes with Daniel Defense's own Flash Suppressor, and just about any optic mounts on the rail. Smith & Wesson knows that most AR-15 owners are going to scrap the stock sights and put their own configuration on there. Save yourself some money with their optics-ready line coming at the factory MSRP of $1,069. It has a flash hider, and seems like it should meet mil-spec to the highest degree. Want a shorter barrel? A unique charging handle? Rock River Arms lets you fully customize the rifle straight from the factory. With their easy to use interface on the website you can have a firing platform created to your exact specifications. The base model comes in at factory MSRP of $1,200. Sig Sauer does German engineering in the states with their top-of-the-line facility in Exeter, New Hampshire. You'll find both the design of the upper receiver and the lower receiver familiar, yet distinct. Their baseline model comes with a lot of bells and whistles for the factory MSRP of $1,200. The pistol grip feels great, and the mid-length barrel is spot on. Windham Armory is the collection of the former Bushmaster employees for the company's buy out and downturn. These guys still know how to make guns with a Picatinny rail and put out some very well priced to performance rifles. Their R16M4FTT comes in a factory MSRP of $1,069. It shouldn't be considered a "budget AR-15" but it's sure priced like one. Like this post? Check out the Short and Specific AR-15 Buyer's Guide.